This small business set up guide is a checklist for the owner/manager of a business enterprise or for one contemplating going into business for the first time. The questions concentrate on areas you must consider seriously to determine if your idea represents a real business opportunity and if you can really know what you are getting into. You can use it to evaluate a completely new venture proposal or an apparent opportunity in your existing business. Perhaps the most crucial problem you will face after expressing an interest in starting a new business or capitalizing on an apparent opportunity in your existing business will be determining the feasibility of your idea. Getting into the right business at the right time is simple advice, but advice that is extremely difficult to implement. The high failure rate of new businesses and products indicates that very few ideas result in successful business ventures, even when introduced by well established firm. Too many entrepreneurs strike out on a business venture so convinced of its merits that they fail to thoroughly evaluate its potential. This checklist should be useful to you in evaluating a business idea. It is designed to help you screen out ideas that are likely to fail before you invest extensive time, money, and effort in them. A feasibility study involves gathering, analyzing and evaluating information with the purpose of answering the question: "Should I go into this business?" Answering this question involves first a preliminary assessment of both personal and project considerations. The first seven questions ask you to do a little introspection. Are your personality characteristics such that you can both adapt to and enjoy business ownership/management? 1 Do you like to make your own decisions? 2 Do you enjoy competition? 3. Do you have will power and self-discipline? 4. Do you plan ahead? 5. Do you get things done on time? 6. Can you take advise from others? 7. Are you adaptable to changing conditions? The next series of questions stress the physical, emotional, and financial strains of a new business. 8. Do you understand that owning your own business may entail working 12 to 16 hours a day, probably six days a week, and maybe on holidays? 9. Do you have the physical stamina to handle a business? 10. Do you have the emotional strength to withstand the strain? 11. Are you prepared to lower your standard of living for several months or years? 12. Are you prepared to loose your savings? 1. Do you know which skills and areas of expertise are critical to the success of your project? 2. Do you have these skills? 3. Does your idea effectively utilize your own skills and abilities? 4. Can you find personnel that have the expertise you lack? 5. Do you know why you are considering this project? The next three questions emphasize the point that very few people can claim expertise in all phases of a feasibility study. You should realize your personal limitations and seek appropriate assistance where necessary (i.e. marketing, legal, financial). 7. Do you have the ability to perform the feasibility study? 8. Do you have the time to perform the feasibility study? 9. Do you have the money to pay for the feasibility study done? 1. Briefly describe the business you want to enter. 4.Why would someone buy your product/service? 5.What kind of location do you need in terms of type of neighborhood, traffic count, nearby firms, etc.? 6. List your product/services suppliers. To determine whether your idea meets the basic requirements for a successful new project, you must be able to answer at least one of the following questions with a "yes." 1.Does the product/service/business serve a presently unserved need? 2. Does the product/service/business serve an existing market in which demand exceeds supply? 3. Can the product/service/business successfully compete with an existing competition because of an "advantageous situation," such as better price, location, etc.? A "Yes" response to questions such as the following would indicate that the idea has little chance for success. 1. Are there any causes (i.e., restrictions, monopolies, shortages) that make any of the required factors of production unavailable (i.e., unreasonable cost, scare skills, energy, material, equipment, processes, technology, or personnel)? 2.Are capital requirements for entry or continuing operations excessive? 3. Is adequate financing hard to obtain? 4. Are there potential detrimental environmental effects? 5. Are there factors that prevent effective marketing? 1. How much income do you desire? 2.Are you prepared to earn less income in the first 1-3 years? 3.What minimum income do you require? 4.What financial investment will be required for your business? 5.How much could you earn by investing this money? 6.How much could you earn by working for someone else? 7.Add the amounts in 5 and 6. If this income is greater that what you can realistically expect from your business, are you prepared to forego this additional income just to be your own boss with the only prospects of more substantial profit/income in future years? Besides return on investment, you need to know the income and expenses for your business. You show profit or loss and derive operating ratios on the income statement. Dollars are the (actual, estimated, or industry average) amounts for income and expense categories. Operating ratios are expressed as percentages of net sales and show relationships of expenses and net sales. For instance 50,000 in net sales equals 100% of sales income (revenue). 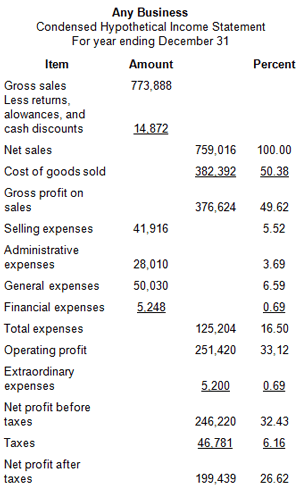 Net profit after taxes equals 3.14% of net sales. The hypothetical "X" industry average after tax net profit might be 5% in a given year for firms with 50,000 in net sales. First you estimate or forecast income (revenue) and expense dollars and ratios for your business. Then compare your estimated or actual performance with your industry average. Analyze differences to see why you are doing better or worse than the competition or why your venture does or doesn't look like it will float. Forecast your own income statement. Do not be influenced by industry figures. Your estimates must be as accurate as possible or else you will have a false impression. 1. What is the normal markup in this line of business. i.e., the dollar difference between the cost of goods sold and sales, expressed as a percentage of sales? 2. What is the average cost of goods sold percentage of sales? 3.What is the average inventory turnover, i.e., the number of times the average inventory is sold each year? 4.What is the average gross profit as a percentage of sales? 5. What are the average expenses as a percentage of sales? 6. What is the average net profit as a percent of sales? 7. Take the preceding figures and work backwards using a standard income statement format and determine the level of sales necessary to support your desired income level. 8. From an objective, practical standpoint, is this level of sales, expenses and profit attainable? The primary objective of a market analysis is to arrive at a realistic projection of sales. after answering the following questions you will be in a better positions to answer question eight immediately above. 1. Define the geographical areas from which you can realistically expect to draw customers. 2. hat is the population of these areas? 4. What is the average family size? 5. What is the age distribution? 6. What is the per capita income? 7. What are the consumers' attitudes toward business like yours? 8.What do you know about consumer shopping and spending patterns relative to your type of business? 9. Is the price of your product/service especially important to your target market? 10. Can you appeal to the entire market? 11. If you appeal to only a market segment, is it large enough to be profitable? 1. Who are your major competitors? 2. What are the major strengths of each? 3. What are the major weaknesses of each? Product lines (quality, breadth, width)? Image from a consumer's viewpoint? 5. Do you know of any new competitors? 6. Do you know of any competitor's plans for expansion? 7. Have any firms of your type gone out of business lately? 9. Do you know the sales and market share of each competitor? 10. Do you know whether the sales and market share of each competitor are increasing, decreasing, or stable? 11. Do you know the profit levels of each competitor? 12.Are your competitors' profits increasing, decreasing, or stable? 13. Can you compete with your competition? 1. Determine the total sales volume in your market area. 2. How accurate do you think your forecast of total sales is? 3. Did you base your forecast on concrete data? 4. Is the estimated sales figure "normal" for your market area? 5. Is the sales per square foot for your competitors above the normal average? 6. Are there conditions, or trends, that could change your forecast of total sales? 9. Forecast the share of the total market that you can realistically expect - as a dollar amount and as a percentage of your market. 11. Is your forecast of dollar sales greater than the sales amount needed to guarantee your desired or minimum income? 13. Do you need to hire an expert to refine the sales forecast? 1. Can you make a list of every item of inventory and operating supplies needed? 2. Do you know the quantity, quality, technical specifications, and price ranges desired? 3. Do you know the name and location of each potential source of supply? 4. Do you know the price ranges available for each product from each supplier? 5. Do you know about the delivery schedules for each supplier? 6. Do you know the sales terms of each supplier? 7. Do you know the credit terms of each supplier? 8. Do you know the financial condition of each supplier? 9. Is there a risk of shortage for any critical materials or merchandise? 10. Are you aware of which supplies have an advantage relative to transportation costs? 11. Will the price available allow you to achieve an adequate markup? 1. Do you know what your expenses will be for: rent, wages, insurance, utilities, advertising, interest, etc? 2. Do you need to know which expenses are Direct, Indirect, or Fixed? 3. Do you know how much your overhead will be? 4. Do you know how much your selling expenses will be? 1. Are you aware of the major risks associated with your product? Service Business? 2. Can you minimize any of these major risks? 3. Are there major risks beyond your control? 1. Are there any major questions remaining about your proposed venture? 2. Do the above questions arise because of a lack of data? 3. Do the above questions arise because of a lack of management skills? 4. Do the above questions arise because of a "fatal flaw" in your idea? 5. Can you obtain the additional data needed? 7. Are you aware that there is less than a 50-50 chance that you will be in business two years from now?